The fourth largest city in Tennessee, Chattanooga lies at the junction of four interstate highways, is easily accessible and well worth a visit. The city has brought about a renaissance in recent years, redeveloping its riverfront and downtown area to offer an extensive greenway system and river walk that takes strollers through the historic art district and several beautiful parks. Main attractions in the city are the Tennessee Aquarium, Civil War battlefields, the African American Museum, and a Creative Discovery Museum, as well as the renowned Jack Daniels distillery. 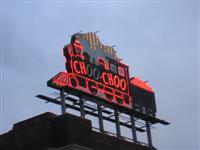 Some visitors may know the Chattanooga Choo Choo song. The Chattanooga Choo Choo Hotel, named after the song, provides the opportunity to sleep in historically decorated train cars and to look at models of trains and trolleys used in Chattanooga over the years. However, the main destination for visitors to Chattanooga is Lookout Mountain, offering its historic Incline Railway, the steepest passenger railway in the world that offers panoramic views of the city and the Great Smoky Mountains 100 miles (161km) away. Lookout Mountain is also home to The Battles for Chattanooga Museum, Ruby Falls (a waterfall that plunges 145ft (44m) inside the mountain), and Rick City Gardens, from where it is possible to view seven states on a clear day. There are zipline tours available from Ruby Falls, an adventurous way to take in both the falls and the beautiful mountains.